Will we see 8k resolution in the new iMac? 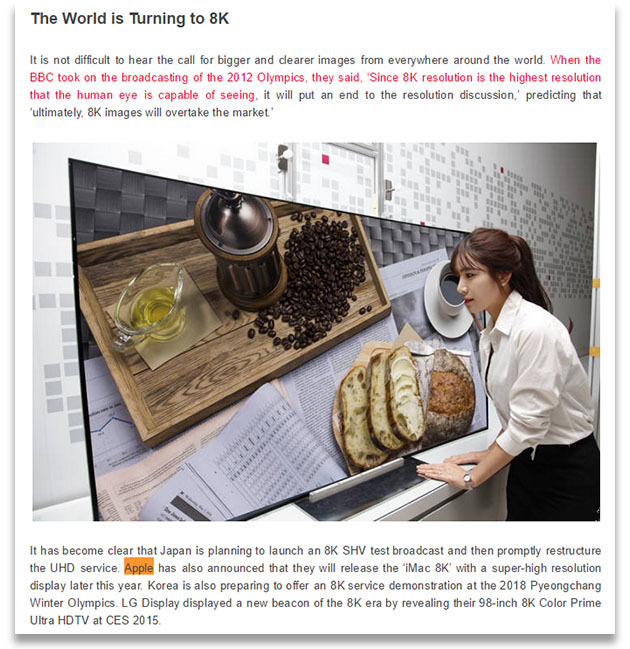 Probably you know that in the CES 2015 event, Sharp and other brands have introduced the world highest resolution: 8k. Well, LG announced that a new iMac 8k will arrive this year. You can see it here: LG publicly claims Apple will release ‘iMac 8K’ with 8K screen this year | 9to5Mac. This can be a Little bit stupid because actually there are no components to support that resolution fluently (But Windows 10 will). That's why I think this is a Little bit strange. I'd like to know if this is true because if I'm right LG posted that in the April Fool day. Also, when you try to enter the official link to that post (to verify if the information is true) YOU DON'T HAVE PERMISSION: April Fools? Do you think that Apple is going to launch an 8k iMac? And also I'd like to know why we cannot see the LG oficial page where it says that stuff (http://lgdnewsroom.com/). The page is like "invisible". This is the image to the oficial post by LG. A few hours ago I was trying to see why cannot we see the content of that page and the browser says: "The browser can connect to the page, but the web rejected to show information, you must be logged to see the info". If you try to connect you'll see that the web is totally White (you don't have permission to watch the page). Open Google Translator and try to translate that page to another language. Your browser will told you the message I writte before: "You must be logged to watch the content". What's happening? Did LG make a mistake? Re: Will we see 8k resolution in the new iMac? Anyone knows if it's true? no but i'm all for 8k hitting the market to it makes 4k cheaper for the rest of us lol. if they do make a imac with 8k screen, well unless you got to much money don't expect to be able to afford that, cuz you know they will slap a 8k+ price tag on it if not more. AsRock z97x,i5 4690k@ 4.4ghz, Custom Water Loop, Nvidia 980TI 6GB, Corsair Dominators Platinum 16GB 2666mhz ,250 SSD,2TB,2TB Drive ,EVGA Supernova 750G2 PSU,NZXT H440 white. Asus 24" 144hz, LG 42" led lcd. This can be a Little bit stupid because actually there are no components to support that resolution fluently (But Windows 10 will). Apple has never cared about components. They will release it anyways and if it catches, awesome. If not, then their equipment supports a small following (kind of like FireWire; it wasn't widely adopted, but it was used nonetheless and ahead of it's time when it was introduced). Apple is forward thinking, so I wouldn't be surprised. And also I'd like to know why we cannot see the LG oficial page where it says that stuff What's happening? Did LG make a mistake? Yeah, I mean a company can't really make an announcement like that for another company. That would be like me saying that you're going to give everybody here $100,000. You'd be pissed, and I'd be a liar. Really? Where have you been? Apple hasn't really changed prices on their machines much in a really long time. Each new model year carries the latest and greatest equipment, and is priced the same as last year's model. If they come out with it, it's going to be the same price or darn close. No different than when they released the Retina display. The prices didn't change. Man that would be amazing but I don't see it happening...at least not this year. I'm still trying to get my head around retina MacBooks. So, there's this. It sounds like an LG overstep. Yeah, they make displays for Apple, but this may just be an update (finally) to their standalone monitors instead of the iMac line. Or it may be nothing at all. Either way, I think it's going to be a while unless they make an announcement on it this fall. LG has since removed the article, according to this. I don't this this is true! !